Owning a Taylor should be easy, fun and profitable! Take some time to look at our operational videos on how to take care of your Taylor soft serve, grill and frozen beverage machines. By following the manufactures recommended cleaning procedures, tune-up kits, brushes, blades and always use using Taylor Genuine Parts®, you should have years of worry free use of your Taylor equipment. Would you like to sign up for our Auto Tune-Up program? Give us a call and we will automatically ship you a set of blades, tune-up kit, sanitizer and lube based on your Taylor model and recommended maintenance schedule. Sanitizing and priming your C-series is a an important process. Priming your machine will allow you to start off with the proper air to mix ratio. This overrun will stay until the next time you have to clean your machine. To properly prime your machine, refer to your manual or watch the short video supplied below. 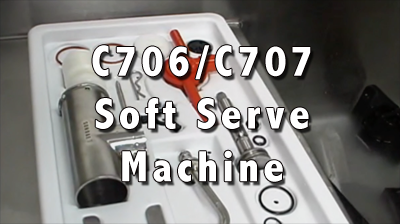 Operational video on the proper way to sanitize and prime your Taylor 8756 coaxial pump soft serve machine. In this video we show you how to properly assemble the Taylor 428 frozen beverage machine. This can be used for the Taylor 430, 432, 340 & 342 machines. In this video we show you how to properly assemble the Taylor twin twist C series soft serve machine. This includes the Taylor C712, C713, C722 & C723 machines. Operational video for Tayor Twist style soft serve machines. Operational video for priming the Taylor 8756 soft serve freezer. This operational video will show you how to clean, sanitize, prime and run your Taylor low production soft serve machine. This covers the Taylor 161, 162 & 168. Stick with us while we continuously update this page! If you need Taylor Genuine Parts® or Taylor & Health Department approved sanitizer. Please call 800-678-2956 and ask for our parts department.